French territory: At least 10,000 protesters in Rennes, Nantes and Angers on January 19. The Gilets Jaunes mobilizations are getting bigger. While the government is staging a “great debate”, which is in fact a great presidential monologue in cities under siege, empty and bunkered, the Yellow Vests revolt is not running out of steam. In the West, the movement is even spreading to cities that had previously remained rather calm. A quick look back at Act X, on Saturday 19 January, in Nantes, Angers and Rennes. In Angers, until now, the Yellow Vests movement and its small demonstrations had not been much talked about. Or from an unflattering angle: a gang of far-right activists tried to lead a demonstration in December. It must also be said that many Angevins demonstrate in Nantes every week. This time, a regional call to converge in the city of Maine-et-Loire had circulated. In the days before the demo the prefect announced a “closed” city, a “banned” demonstration, and the media had raised anxiety about groups “from elsewhere”. This did not prevent several thousand people from finding their way around, marching past and thwarting all the police traps. The prefectoral decree prohibiting access to the historic city centre lasted no more than fifteen minutes. A handful of racist activists were also asked to leave in the early afternoon. Thus, the 3 to 4000 demonstrators managed to reach the heart of the city, the Place du Ralliement, which was guarded by a large police force. The gendarmes, surrounded by the protesters, had to leave without violence before they started firing tear gas grenades. This led to the start of a series of clashes throughout the city. Barricades were getting bigger on the main boulevards. A fire was lit in front of a branch of the Banque de France, the fire itself was surrounded by barricades to prevent the flames from being extinguished too quickly. The prefecture was also targeted, demonstrators were pushed back by a water cannon, with particularly intense clashes. Unseen images for this city, usually known for its calmness. 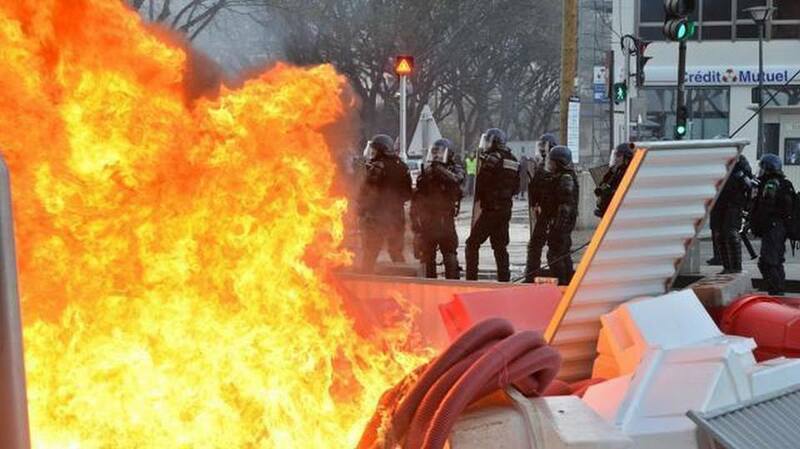 It must be said that we haven’t seen burning barricades in Angers since May 68. In Rennes, where, as in Angers, the Yellow Vests movement had not been very dynamic, a regional call had also been issued. With the same police scenario, the same anxious headlines in the press. As in Angers, the challenge of the demonstration will therefore simply be to be able to demonstrate in the city centre, which was banned. This Saturday, the Breton city is back to the excitement it experienced during the resistance against the Loi Travail ( A neoliberal labour law), with at least 3000 demonstrators, several hours of parades, skirmishes, and the invasion of the city’s historic center in the late afternoon. Tags, various actions, barricades, bonfires and tear gas shots. Police excessively used their ammunition, several injuries have been reported, including a woman who suffered severe discomfort during a charge and was left inanimate on the ground. And in Nantes? Despite the “regional” calls in the two neighbouring cities, and the delirious level of repression reached every week, this Saturday was still marked by a major demonstration of several thousand people, who valiantly kept the streets from 1pm to 8pm. With, as a novelty, an unprecedented convergence. A call to demonstrate “against racism and fascism” had been circulating on the networks for several days. Rather than having two parades at the same time in the city, the Yellow Vests and anti-racist collectives marched together behind uncompromising banners against the poison of the racist division in Nantes. This is an encouraging first step, which makes it possible to affirm that xenophobia and discrimination are not welcome in the ongoing popular revolt here. After a first march in black clothes and rather calm yellow vests, the anti-racist collective that organized the first round dispersed at the prefecture by launching a surprising appeal to avoid clashes with the police to remain “safe”. As if the violence was not triggered by the police during demonstrations, like in the neighbourhoods. The demo came back for a second round, and continued to swell. Determination was on the rise. There were, here too, around 3000 demonstrators. After several grenades had been fired on the Cours des 50 Otages (street in Nantes, EIE), the demonstration invaded the rich districts of Guist’hau, Graslin and the streets around the Museum of Natural History, as far as Mellinet. Charges and clashes started. There were arrests too. An antifascist banner was stolen with brutal violence. We saw the BAC (plain clothes cops units), armed and hooded, arresting protesters because they were allegedly “hiding their face” or “carrying a weapon”. Which is as funny as it is worrying. Fires were lit at different points in the city. It was getting dark and die-hard people were still on the street. Around 7pm there was a gas overdose in the city centre. Bar terraces at the Cours des 50 Otages courtyard received grenades free of charge. A bar owner expressed his anger against the police when demonstrators pass by: “We merchants agree with you.” Rows of police officers criss-cross the courtyard under booing, we no longer knew who was protesting or passing by after the projectiles were fired. It is reported that a jewelry store was attacked. Fireworks against heavy fire from the new multi-shot rifles. The police forces seemed to be in total freewheeling mode. Police trucks drove directly into the crowd in front of the Dukes’ castle, zigzagging through groups of demonstrators. An extremely dangerous attack, people jump into the moat. A 60-year-old woman was shocked by the repeated violence of the police. The medics recorded about forty injured people, including two open head wounds. Despite the intensity of the repression, the police once again failed to silence the protest. This Act X was marked by an extension of the Yellow Vests movement in the West. Thousands of people have held the streets simultaneously in Nantes, Rennes and Angers. In Toulouse, at least 10,000 people were demonstrating at the same time, a record, and barely less in Bordeaux. Nothing stops a rising revolt. To be continued!